Louis Alexandre Berthier looked around and shivered.But not because it was cold. It was their location. The night had not yet begun its retreat before the advance of the sun, and its last vestiges still clung to the edges of the vast canopy of stars that stretched above the desert. It was cool but comfortably so; not frigid enough to cause a chill in the air. It was something else that was getting to him. A veteran of many battles, there was little that could rattle him. Yet, tonight, he felt a sense of disquiet that he had never experienced before. Berthier glanced at the faces of the two soldiers with him. In the light of the torches, their faces reflected his own anxiety, nervousness and — though he was loath to admit it — fear. They had spent the better part of the night in a small, makeshift camp at the base of the largest pyramid of the three that towered over the Giza plateau. It soared hundreds of feet into the sky, its tip lost in the darkness and its base barely scratched by the flicker of the flames from their torches. Not far away loomed another silhouette — the head of the enormous sculpture of the man-beast, with its inscrutable expression, commonly known as the ‘Sphinx’. The inexorable advance of the sand dunes over centuries, had covered the bulk of the stone body of the Sphinx, leaving just the head exposed. There was something unnerving about this place. He wouldn’t have been here of his own accord. Yet, what choice had they been given? Berthier reflected on the events that had brought them here. The last twelve months had been spent in military campaigns in Egypt, not all of them successful. But the highlight of the expedition led by Napoleon Bonaparte had been the wondrous architectural ruins — stone temples that soared towards the sky, defying gravity; giant statues sculpted thousands of years ago out of stone, depicting the rulers of yore — and the broken stone stele that had been discovered just a month ago by Captain Pierre Bouchard. Dubbed the ‘Rosetta stone’ it had caused unparalleled excitement among historians since it presented a means to finally decipher the hitherto incomprehensible Egyptian script that was so commonly inscribed in the temples and tombs of the country. And then, Napoleon had suddenly decided that he would spend a night inside the largest pyramid of the trio that stood on the Giza plateau. Someone had told him that Alexander and Julius Caesar, too, had done this, and Napoleon was fired with the ambition of matching those great generals. Berthier, who was Napoleon’s chief of staff, had argued with his general, trying to dissuade him using logic, but to no avail. was supposed to have been built to hold the body of the pharaoh, Khufu, who had constructed the pyramid as a grand tomb for himself. Of course, Khufu’s body had never been found, the pyramid having been discovered to be empty, with no sign of either the Pharaoh’s mummy or treasure and bereft of the ubiquitous inscriptions found in Egyptian tombs. With grave misgivings, Berthier and the soldiers had left their general in the chamber and, in accordance with his instructions, gone from the building to camp outside and wait for his return at dawn. Napoleon, himself, had shown no signs of anxiety or fear. He had appeared curious, excited even; poking into the corners of the room and the sarcophagus, examining the bare walls of the chamber in the light of the single lamp that was to be left with him. Berthier shivered again. It was a mistake; he could feel it in his bones.The chamber that Napoleon had decided to conquer had an eeriness about it. He had felt it last night when he had accompanied Napoleon to settle him in. It was almost as if there was an invisible presence in the stone room. The sarcophagus may have been empty, but Berthier could not help feeling that there was something in that chamber. The pyramid had been empty and sealed shut for thousands of years, its original entrance concealed by the builders. Was it possible that some spirit or demon had taken up residence there in the intervening centuries? He shook his head, trying to convince himself that he was imagining things. Others had been inside the pyramid since Al-Mamoun’s intrusion. Yet, no one had ever spoken of hauntings or spirits. A shout from one of the soldiers broke his reverie. He glanced towards the base of the pyramid. A dark human figure could be seen, staggering and stumbling as it made its way towards them. Berthier rose swiftly and ran towards his general, the two soldiers hurrying behind him. He reached Napoleon before the others and recoiled in shock as he saw his general’s face. The normally robust features had been replaced by an expression that combined horror and desperation. The excitement and confidence of the previous night were gone. His stricken look, on a face that seemed to have been drained of all blood, gave him the appearance of a cadaver and his arms were outstretched as if searching for succour; for a means of support, help and rescue. Berthier grasped Napoleon by his arms and supported him as the mighty general leaned his weight upon him, as if collapsing with relief. The two soldiers were still a short distance away. Napoleon shook his head and looked Berthier in the eye for a fleeting moment of lucidity that seemed to cut through his confusion and fear. Berthier’s blood ran cold at Napoleon’s response. The general’s voice was hoarse with terror. Dhananjay Trivedi hurried along, casting nervous glances around him as he walked. A deep, dark fear seemed to engulf his very soul. And he didn’t understand it. Dhananjay was a history teacher in a reputed school in New Delhi. A gold medallist from Allahabhad University, the world of academia had been waiting to welcome him with open arms. He had surprised many when he became a teacher. He loved his job and more importantly, his students at school loved him. There was hardly a student who wouldn’t gush about Dhananjay’s classes, which were known to be fun. He was a wonderful guide, walking his students through the trails of history with stories that kept them mesmerized in class. Dhananjay’s strategy was simple. He believed that if his students enjoyed studying history, they would be more attentive, more curious and learn more. Some of the other teachers would grumble about how devoted the students were to Dhananjay. It was almost as if he cast a spell upon them from the moment he walked into the classroom. 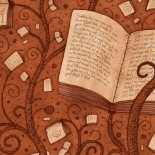 What no one knew, was that the much-adored history teacher had a secret of his own. It was this very secret that had led to the encounter today, which had left him in his present state of disquiet. It had started innocuously enough, with a young man approaching Trivedi as he stepped outside the school gate. The youth seemed to be in his late teens; definitely not more than nineteen or twenty. Trivedi had recognized the name. He had heard of it before. The young man was a member of the Gana. Trivedi’s curiosity had mounted. What could the young man want from him? Without further ado, Vishwaraj had drawn him aside. His words were brief and to the point. Trivedi listened, astounded at what Vishwaraj had to say. Trivedi appraised the young man in front of him. This was an unforeseen development. A member of the Gana gone rogue. He couldn’t fathom what Vishwaraj’s intentions or motives were but he knew that the Sangha didn’t know about Vishwaraj’s apostasy. But there was nothing he could do for now. The Sangha would have to decide how to deal with this situation. Vishwaraj said nothing. His youthful face was hard as his eyes bored into the schoolmaster. Suddenly, Trivedi felt a nameless fear in the depths of his heart. Despite his casual dismissal of the youth, he felt there was something that he was missing. Something that was gnawing at his subconscious mind, but wouldn’t come out into the open. He turned away. This meeting was over. But one thought ran through his mind repeatedly as he made his way home. How did Vishwaraj know about the boy? As he stood outside his apartment and fumbled with the keys to the front door, his mind raced with possibilities. This incident could not go unreported. Especially since it concerned the boy. He opened the iron grill door, then unlocked the inner, wooden door and stepped in, locking both doors from the inside. For a few moments, he leaned against a wall, breathing hard. He still couldn’t understand his own anxiety. Vishwaraj was just a powerless youth, incapable of delivering on his threat. So why had the brief conversation with the boy unnerved him? He whipped out his mobile phone and dialled a number. As the call connected, he began speaking rapidly, describing what had just happened. His breathing slowed as the person on the other end of the line seemed to offer him words of assurance, calming him down. By the time the conversation was over, Trivedi had almost recovered his composure. He ended the call and placed his phone on the dining table. That was when it struck him. The reason why he had been feeling uneasy since the encounter with Vishwaraj. Why hadn’t he seen it earlier? As the realization dawned, the apartment erupted in flames. The fire was everywhere. It was as if every atom of the flat had spontaneously ignited at exactly the same moment. Trivedi now knew that he had been wrong about Vishwaraj. He had made a big mistake. And he was going to pay with his life. But that didn’t bother him as much as the fact that it was now too late to tell anyone else. He could only hope that his death would warn the others. The future of the world was at stake…. 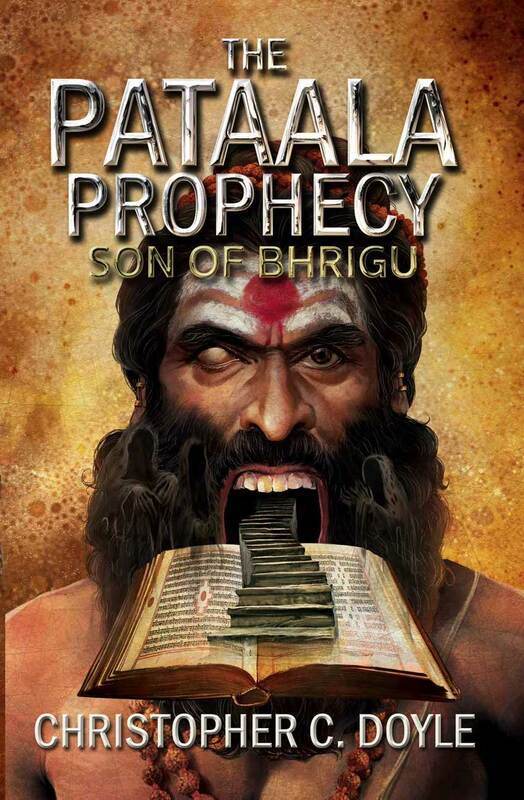 This entry was posted on April 18, 2018 by artikabakshi in excerpt, Indian, Mythology and tagged Christopher C. Doyle, Son of Bhrigu, The Pataala Prophecy.